We tried to keep things simple with our flower lapbook, given that there was quite a bit of hands–on activitiesto learn from. Once again, we used part of a preschool pack to build our lapbook (preschool packs are surprisingly adaptable for this purpose). On the left hand side there is an image of a flower cut into sections, if you lift back the section you will see LittleMan has traced the name of that part of the flower. In the middle there is bulb growth sequencing cards which have been hole punched and tied into the book for easy removal. The green clothes pin is meant to be a flower stem holding cupcake liner “flowers” each of which have a letter from LittleMan’s name; he can remove the cupcake liners from the clothes pin, arrange them in the order of his name, then place them back into the clothes pin when he is finished. On the top right side is a color and shape mini book, always good to review the basics! The baggie on the lower right side holds a printable I’ve created: Upper Case Lower Case Alphabet Match-Up Feel free to download this printable for your own personal use. It is simply 26 flowers, each with a different color combination. On one side is an uppercase letter, on the otherside is a lowercase letter. 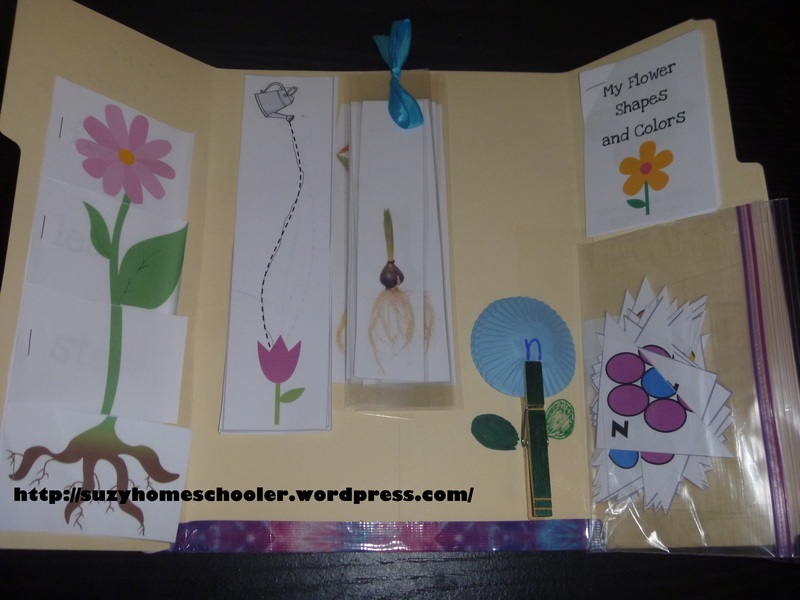 The flower is cut in half along the grey line of the printable then the children match up cards. 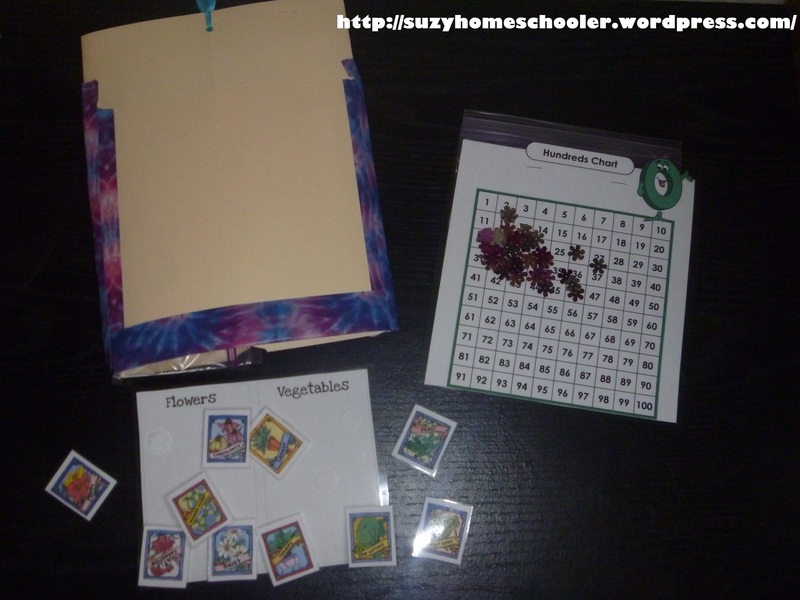 On the back of the lapbook is a pocket with two activities, the first is sorting flowers and veggies which is from Homeschool Creation’s garden preschool pack and the other is a counting to 100 activity. I laminated a 100’s chart (I’m sorry I’m not sure where I got the hundred’s chart from but if you Google it you’ll find quite a few options), then I stapled a plastic baggie to the back of the chart and filled it with 100 pieces of flower shaped sequins. LittleMan places one flower on each numbered square in order from 1-100 saying the number he is covering as he does so.